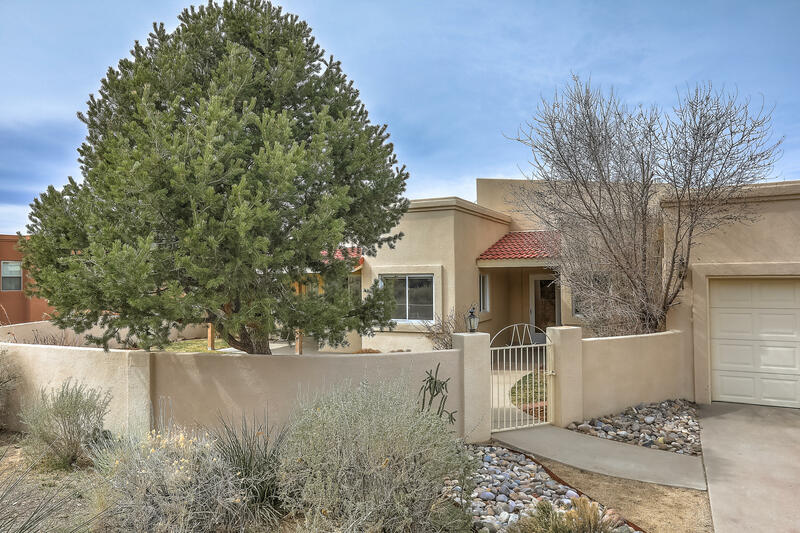 1505 Arenas Place SE, Albuquerque, NM.| MLS# 938833 | Albuquerque Real Estate Company Specializing in Residential Home Sales & Buyers Representation, Commercial Sales or Acquisition, and Commercial Property Management. Call Real Estate incorporated (505) 433-3100 for all your Real Estate needs! Well-cared home in a private cul-de-sac in the Four Hills neighborhood. Natural southwest landscape leads into a lovely courtyard with a lawn and flowerbeds. The foyer opens onto the large, light and bright great room with a raised ceiling, gas fireplace, ceiling fan and a balcony looking west. Gorgeous nighttime views of the City lights. The formal dining room leads into the kitchen with granite countertops, cooktop and a breakfast nook with access to the front courtyard. The main floor master bedroom has access to a second balcony through the ensuite bathroom as does a guest bedroom. Two other bedrooms and a full bathroom on the lower level could also be a great in-law quarters with access to the backyard. NEW FURNACE and WATER HEATER. Steps from walking trails in the foothills. DIRECTIONS: From Tramway East On Central To Four Hills Rd. At The Y Continue Left On To Stagecoach Road. Follow Stagecoach East And Then South To Arenas.